The 2015 UK general election saw a majority Conservative government elected with the support of less than a quarter of the voting age population, leading to renewed calls for a change from the First Past The Post (FPTP) voting system to a form of Proportional Representation (PR). 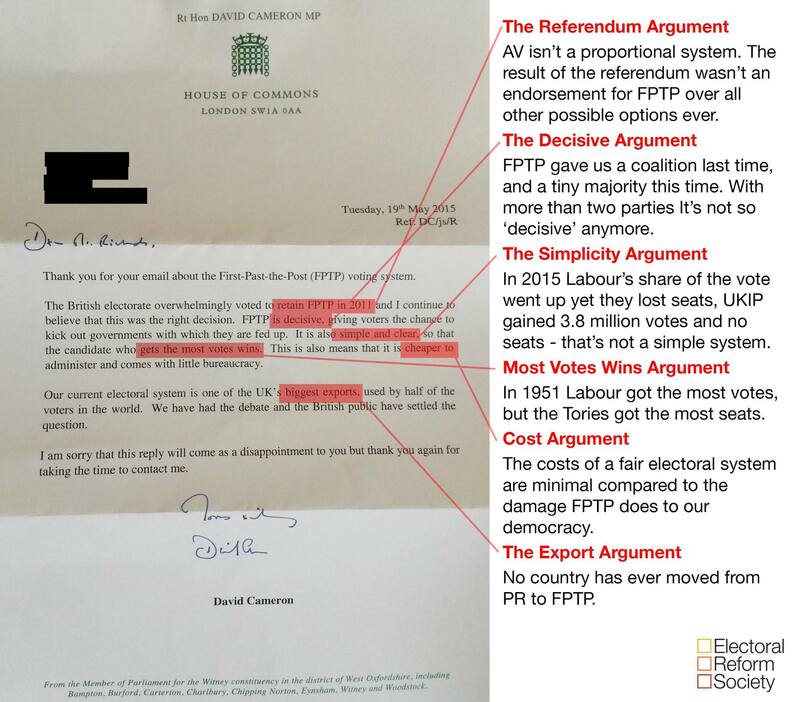 The Electoral Reform Society can correct the false assertions as much as they like. The government’s position is not going to change. This is why campaigning for PR as the catch all solution to the problems of our failing ‘democracy’ is the wrong approach. NOTA UK’s detractors have made similar false arguments against inclusion of a formal ‘None Of The Above’ (NOTA) option on ballot papers in the past. But when confronted with the irrefutable argument that NOTA is an essential pre-requisite in any system claiming to be a democracy, they literally have nothing to say. Because it is impossible to dress opposition to NOTA up as a pro-democracy argument, once its true significance is understood. Whereas PR can always be refuted in seemingly pro-democracy terms. For this reason, NOTA would be achievable as an unavoidable government concession with enough widespread understanding of and support for it. PR never will be all the while only entrenched beneficiaries of FPTP are in power – which is always and forever as things currently stand. Once in place, by virtue of giving a potential voice to literally millions of currently silent and unrepresented voters, NOTA would level the playing field considerably and pave the way for further democratic reform. Consequently, NOTA remains the ground zero of electoral reform upon which all other democratic progress could be built.